Each session, we have a strong medical team, consisting of two nurses and a physician who live on site and take care of our campers’ medical needs and medication management. We have a Health Care Center (HCC) with recuperation/isolation beds, examination area, secure medication storage, and housing for the nurses. The physician sees campers after meals and wears a radio so as to be reached at other times as needed. Our Staff Training contains components to teach staff safety and injury-prevention strategies and the majority of our counselors are certified in 1st Aid and CPR. 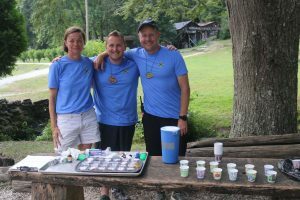 The health-care team will call you if your child is prescribed a medication while at camp, has to spend the night in the HCC, or whenever they deem a matter “significant.” Any use of medical consultants / diagnostic testing will be discussed with you prior to (if possible) and after visits. Health personnel are available on closing day for discussion of any health matters which may have occurred. Please stop by the HCC with any concerns. We do require several forms to be completed in order to gather necessary information to care for your child. These forms collect information about the camper’s health history, signatures to consent for treatment, insurance information, immunizations, and a physical exam. Health forms are due by May 1. Physical exams must have been completed within 24 months of camp. Please go to the Forms page for more information about these and other forms. All medications and vitamins must be left with the health care team as part of the check in procedure on Opening Day. Campers are not allowed to have medications in their cabins. Medications will then be dispensed to campers by the nurse at appropriate times. In some cases, inhalers, topical medications or epi-pens may be exceptions to this rule, if deemed appropriate by the camp physician. It is very important to bring prescription medications in the container in which the pharmacy dispensed them. Please do not bring common over the counter medications that you feel your child “might need” as the HCC keeps these items in stock and will provide them if and when needed. Parents of campers with special health or behavioral concerns should discuss these needs with a director before enrolling your child to help ensure a healthy and positive camp experience for him or her. Important information will be shared with your child’s counselors so that they can help your child meet with success. With our emphasis on healthy, well-balanced meals, children are able to try new or different foods in the dining room and on cook-outs. If, for medical or religious reasons, your child requires a specific diet, please communicate this prior to enrolling and be sure to list it on the health form. With advance communication, we can work with you to determine what we can accommodate and what you may need to supplement. We ask that your child stick with their dietary needs for the whole time they are at camp, and not change partway through, or choose when they want to have that diet. Almost all medical situations which arise while your child is at camp are handled on-site at the HCC at no additional cost to you. More advanced diagnostic testing or subspecialty consultations, when needed, are easily accessed in the Brevard/Hendersonville/Asheville area, using your family’s health insurance. Prescription medications are selected with cost awareness and will be added to your camp store bill. Good hygiene is essential at camp and helps to keep our community healthy. 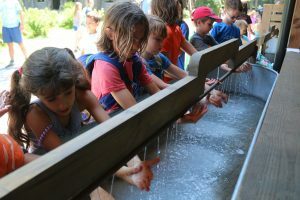 Washing one’s hands well is a key to good hygiene so we would encourage you to talk to your child before coming to camp about washing hands thoroughly with soap and water. We train our staff in this process and teach them proper hand washing techniques so that they can supervise the children when washing their hands. Teaching children to sing the ABC song or the Happy Birthday song twice while washing hands helps them take enough time to wash thoroughly. Camp has large hand washing sinks (troughs) outside of our dining room where all children and staff must wash hands before eating. There are hand washing sinks at the stables, the Farm, and in various locations around camp. 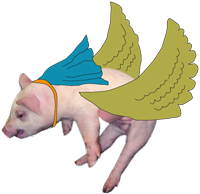 The Farm is a very magical and educational part of our program. We grow approximately 20,000 lbs. of vegetables each year and have a variety of farm animals. When working with animals, it is extremely important for children and staff to wash hands before and after working with the animals to help prevent the spread of illness. Hand to mouth contact with animal manure can cause illnesses such as cryptosporidium, salmonella, etc., therefore, our Farm Rules require children and staff to wash hands before and after working with any animals. We encourage you to speak to your child to help educate him/her about these risks and to encourage good hand washing procedures anytime they visit a farm or petting zoo. Each area of camp has its own shower house. If your child is accustomed to only taking baths, please have him / her practice showering and washing his/ her own hair independently before attending camp. We ask our campers to shower at least every other day at camp.